Magnus Chase has always been a troubled kid. Since his mother's mysterious death, he's lived alone on the streets of Boston, surviving by his wits, keeping one step ahead of the police and the truant officers. One day, he's tracked down by an uncle he's never met-a man his mother claimed was dangerous. His uncle tells him an impossible secret: Magnus is the son of a Norse god. Sometimes, the only way to start a new life is to die . . . This limited edition is numbered and signed by the author. It comes in a full-color case and has specially designed endpapers and a full-color frontispiece. Rick Riordan (www.rickriordan.com) is the author of three # 1 New York Times best-selling series with millions of copies sold throughout the world: Percy Jackson and the Olympians, the Kane Chronicles, and the Heroes of Olympus. His Greek myth collection, Percy Jackson's Greek Gods, was a #1 New York Times bestseller as well. His previous novels for adults include the hugely popular Tres Navarre series, winner of the top three awards in the mystery genre. He lives in Boston, Massachusetts with his wife and two sons. John Rocco (www.roccoart.com) studied illustration at Rhode Island School of Design and The School of Visual Arts. 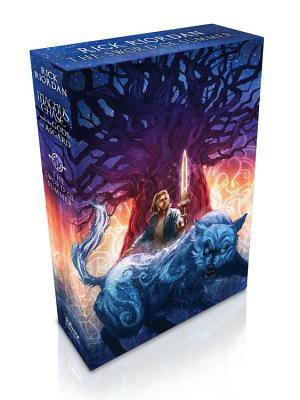 In addition to writing and illustrating his own picture books, including the New York Times best-selling and Caldecott Honor-winning Blackout and its companion, Blizzard, he has created all of the cover art for Rick Riordan's best-selling Percy Jackson, Kane Chronicles, and Heroes of Olympus series. He also illustrated Percy Jackson's Greek Gods. Before becoming a full-time children's book creator, he worked as an art director on "Shrek" for Dreamworks, and for Disney Imagineering. He lives in Los Angeles. "The clash of modern and classical worlds is both exciting and entertaining." "All in all, a winner of Olympic proportions." "Should pacing and wit continue unabated into the third volume, whose foretold European setting promises further freshness, fans will eagerly await numbers four and five." "With a true storyteller's sense of pacing, Riordan creates another compelling adventure, right down to the cliff-hanger at the end. Stay tuned for volume four." "Perfectly paced, with electrifying moments chasing each other like heartbeats." "Adventure fans will relish the action as their heroes confront formidable foes, while readers who have come to love the characters will enjoy following the different individuals as they take the stage in scenes that are usually dramatic, often witty, and occasionally surprising. A satisfying, penultimate entry in the Heroes of Olympus series." "Riordan masterfully orchestrates the huge cast of characters and manages a coherent, powerful tale at once exciting, philosophical and tear-jerking. The bestselling series' legions of fans will cheer their heroes on and rejoice in such a compelling conclusion to the saga." "The novel's winning combination of high-voltage adventure and crackling wit is balanced with scenes in which human needs, fears, and ethical choices take center stage."